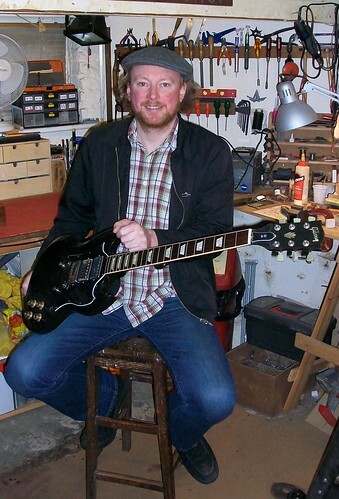 Russ changes the strings on Steve’s Martin M-21 after ever gig. Also Russ uses a semi-liquid lubricant across the nut slots to stop the strings sticking in their slot and to ease tuning. All this may have caused the temporary repair to fail. After another phone call from Russ, it was decided that on the tour’s return to London, the next day, a new nut should be made and fitted. 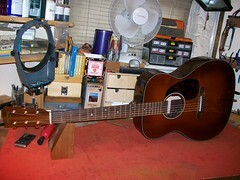 Russ made his way over to the workshop in South East London on Wednesday morning and work was started on Steve’s guitar. 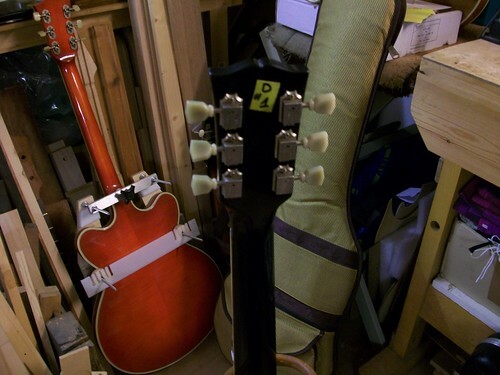 On closer inspection I noticed that the top E string was very close to the edge of the fingerboard. 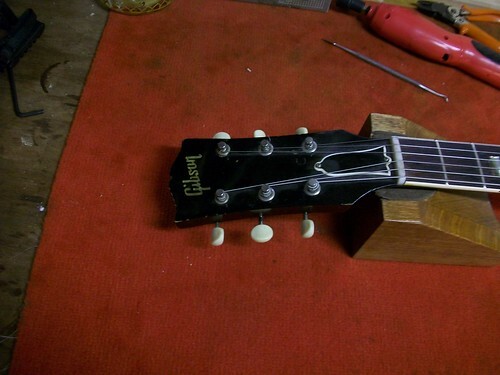 This will cause the string to slip off the edge when played in certain positions. On quizzing Russ about this he mentioned that Steve had had this problem. So it was decided to change the string spacing on the new nut to alleviate this. The recommended distance for the nut slot on the top E is 3mm. Steve’s was less than 2mm. 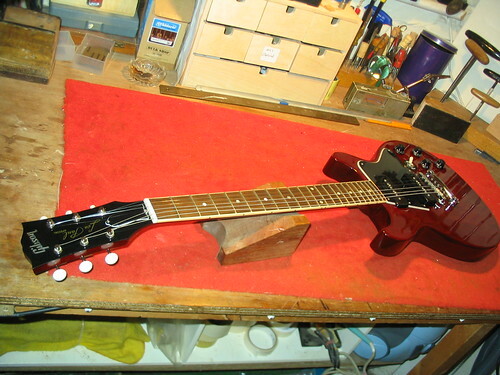 After about an hour the work was completed and the guitar strung up and tested. Russ was on a tight schedule as he had to get back to the Barbican Centre to prepare for the evening’s sell out gig. As a special favour to me and for helping Russ out of a tight spot, I was given two complimentary tickets for the performance at the Barbican that evening, complete with back stage passes to met Steve after the gig. I invited my good friend Cormac Heron along, who’s a great admirer of Steve Earle’s music. Cormac took this video footage and also wrote an excellent review of the evening. Many thanks to Cormac for his input. 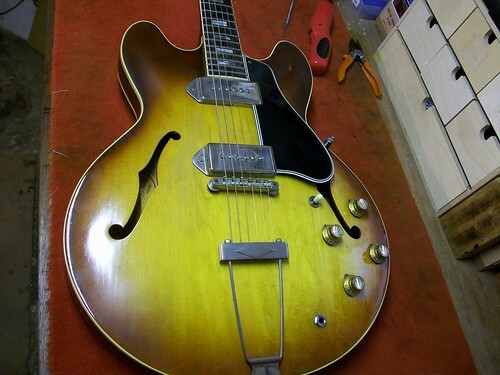 One of the two guitars that is being used on the tour had developed a nasty buzz on the G string, could I help? 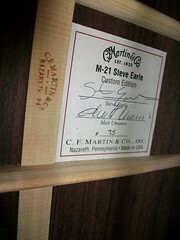 On arriving in the UK could I make time available to make the necessary repair to Steve’s Martin M-21? The tour was scheduled to leave Sweden after the Malmo gig in the early hours and arrive in London Thursday evening. A performance is scheduled at the Fairfield Hall, Croydon on Sat 31st Oct. So with an appointment organised and directions from the crew’s hotel in Knightsbridge, Russ headed off to the workshop in South East London on Friday afternoon. 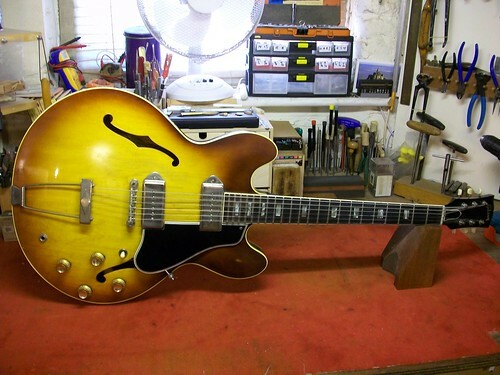 Once on the workbench I was soon able to ascertain that the nut slot had been cut slightly too low resulting in the G string buzzing when the string was played in the open position. This type of string buzz can be easily remedied. There are two options available, to make a complete new nut or repair the defective nut slot. On closer inspection it was decided to make a repair to the nut. 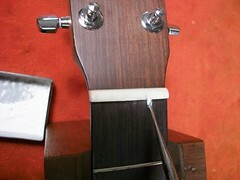 Rebuilding nut slots can be achieved very successfully using bone dust (or baking powder) and superglue. The idea is to build up the faulty nut slot layer by layer until there was enough height to re-cut the slot anew. 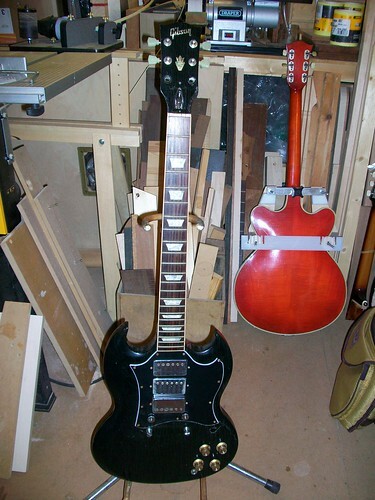 This was done and the guitar was strung up and the rebuilt nut slot cut to match the other nut slots. He mentioned that the Steve Earle tour has only a basic crew. Russ, an outhouse sound engineer plus one other selling Steve Earle merchandise. 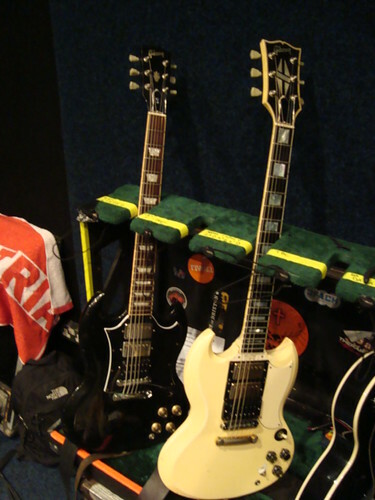 Russ’s responsibility on this tour is to re-string the two Martin guitars after each gig and keep them set up to performance standard. Also he is responsible for the stage set up of microphones, stands and monitors. Russ has to be on hand during each performance in case of any onstage eventualities. He also takes his turn in driving the tour bus. Russ tells me that he enjoys the travel aspect of touring and enjoys exploring new places. 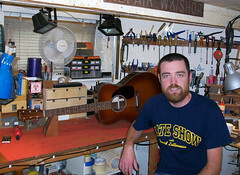 His work as a stage tech has taken him to many cities in the US, Europe and the Far East. As a well earned break from this tour, Russ has an evening off (Fri) and is going to see Jack White of the White Stripes fame. His new band The Dead Weather is performing at HMV Forum London. 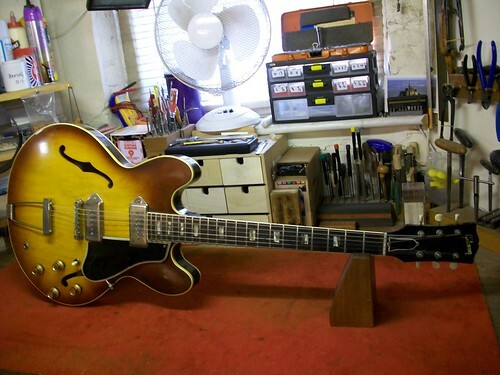 Any commissions and repairs that I am currently working on can be viewed here with the prefix “On the workbench”. Follow me and join the debate or just receive an update.